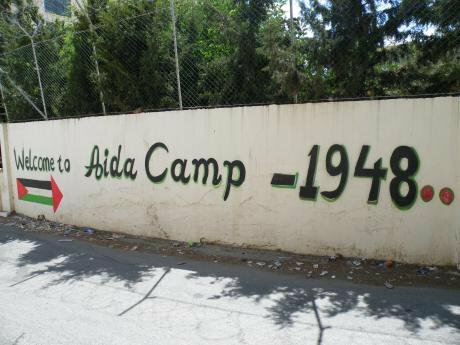 Image: Entrance to the Aida Palestinian refugee camp near Bethlehem, Wikicommons. British politicians talking about forced migration often like to tell us that ‘Britain has a proud history of welcoming refugees’. Spending time in the Calais ‘Jungle’ refugee camp last year I asked people there what they thought of British politicians' words. I heard one answer again and again: ‘You know Britain came uninvited to our countries, and created many problems we experience now’. I then began the process of reading up the histories of each of these countries. I knew some of it – but not from my school-time history lessons. In common with many people educated in Britain, the history I was taught principally covered the Roman and Norman invasions of Britain, a quick jump forward to Henry the Eighth’s wives, and then the Second World War, three times over (although mainly the European bits). The only British occupation we learnt about was in post-Nazi Germany. Palestine: Occupied by Britain in 1917, part of which in 1948 became Israel after the British mandate ended. Afghanistan: Invaded by Britain in 1838, continued military actions in 1920s and 30s, invaded with others again in 2001. Somalia: Occupied by European powers including Britain in 1888, and ruled in part (Somaliland) until 1960. Sudan: Divided and ruled by Britain from 1898 to 1956. Eritrea: Occupied by Britain in 1941, ceded to Ethiopia in 1952 laying the groundwork for the long running civil war that followed. Iraq: Invaded by Britain in 1917, 1941, 1991 and 2003. The list continues: Bangladesh, Egypt, Ghana, India, Iran, Myanmar, Nigeria, Pakistan, Sri Lanka, Zimbabwe. All of them countries which thousands of people have fled from, all of which have been occupied or ruled by Britain or British interests within living memory. Taken together, they account for well over half of the world's refugees. Include Syria – being attacked by British forces right now for the third time in a century, and it’s more than three quarters. With my heart in my mouth I then made my way to the figures for what proportion of the world's refugees reside in Britain. There it was: around 0.5%. The point of this exercise is not to make British people feel bad. It’s to say that the story of people being forced to flee their homes did not begin in 2015 when it reappeared on our television screens. This is the effect of a decades-old cycle of violence - fuelled by resource exploitation and arms sales - which can have effects for generations. It’s a cycle of violence which has been accelerated in the past fifteen years. As with the rise of IS/Daesh – beneficiaries of the recent British military interventions in Iraq and Libya – the effects can sometimes be both rapid and catastrophic. So now, in the week that marks a hundred years since Britain’s broken promise of the Balfour Declaration it’s time to call out the half-truth. Next time someone says that Britain has a proud history of welcoming refugees, it’s time to reply that it has a shameful history of creating them.